I’m a mom of three boys and three girls. It’s easy to show my girls that I love them. I sit and ask them questions. I listen to them talk, and talk, and talk. I buy them pink nail polish with sparkles. I “get” girls. What? I was just trying to show I was interested. My daughter would have loved to share every detail! If you’re a mom of older sons it can sometimes be hard to show your love. Here are 15 ideas to do just that! Ask your son about his most recent video game . . . and then just listen. Make your son’s favorite dinner and let him know you were thinking of him. Tell your son how proud you are of a good character trait you see in him. Visit him at his work. Don’t make it a big deal, but just smile and wave. Invite him to lunch, your treat, at his favorite restaurant. When you’re at the grocery store, text your son and ask if there’s anything he needs. Offer to play his favorite board game with him . . . even if you know there’s no chance of you winning, even if you try. Do his laundry without making a big deal about it. Stop what you’re doing and really listen the next time he wants to tell you something. Let your son overhear you talking to someone else and praising one of his accomplishments. Make snacks for your son and his friends when they’re hanging out at your house. Buy a book he’s interested in and leave it on his bed with a note. Show up next time he invites you to do something with him. Take his problems seriously even when they don’t seem like a big deal to you. These seem like simple things but you know you’re making a difference when you see your son’s SMILE! Now, how about you? 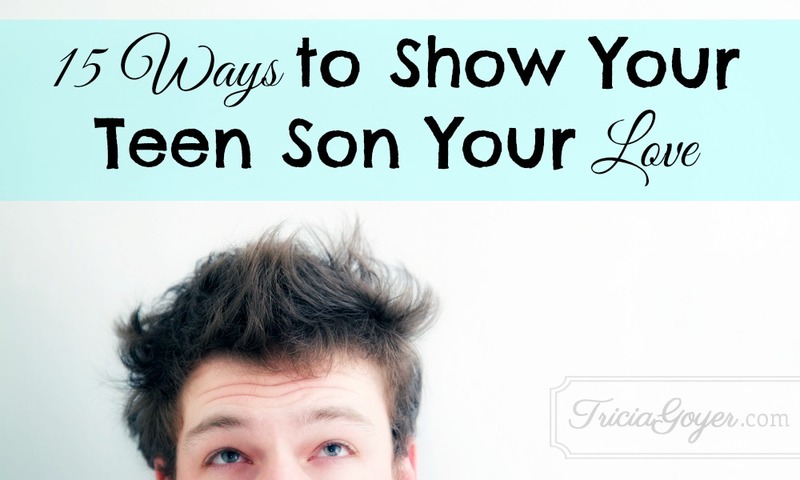 What are ways you show your teen son that you love him? I might mention — our sons-to-be (that we can communicate with almost daily) are 15 and 16 year old brothers. That’s so amazing that you can communicate with them! I think that simple words of respect and encouragement will go a long way! Heather, I don’t know if “family Bible verse memorization” would be possible? Maybe a verse a week that the whole family can work on together, so they can feel like they are participating in something your family does together? My husband is from Haiti. I’m American. We are very affectionate physically. He is not unless it’s more private or with people they know, and are comfortable with. I noticed this with others while in visiting his homeland. Things that have worked for me with my husband: making sure he’s fed well, helping him succeed, be there when he needs me for support, and being interested in his culture. They also seek guidance, and are open hearted to it. He’s also a faithful follower of God. This is very important to him (and myself), so he loves when I spiritually guide him. These things were prevalent in his family and neighborhood — of all ages. Hope this helps. Thanks for these tips! I’m just starting to learn how the teen years are different. I’ll keep these ideas in mind. So glad they’re helpful, Lisa! Love these ideas! I have used them all! They work. I’d add a 16th- give him a shoulder massage. (He may balk at a hug, but a shoulder massage he’ll accept!) I have shared your blog over at my Facebook ministry page for parents http://www.facebook.com/1Corinthians13Parenting . Thanks Tricia! Thank you for sharing, Lori! Also, I love the idea of a shoulder massage. I bet my sons will, too! At bedtime, I would give my oldest son a backscratch and we would talk. I learned a lot.today, HIS oldest son loves Grandma’s backscratchers. He’s now a HS senior. Wonderful list. Especially the parts about listening. That’s what they really want from you. My relationship with my 18 year old and now out-of-the-house son improved so much when I really began to do that. It can be done with text messaging, too. And I ask his advice on things. He likes that. Oh, I really like the idea of asking for advice! Thank you for sharing!! Great list. Pretty much covers my son and myself. He likes to just chat about his favorite video games and podcasts (and can do it for hours!). 🙂 When I feel knee deep in other things, I always remind myself that there will be decades to come where I will wish I could spend that kind of time with him. I do all that is on that list already. I also sit together for breakfast.and just talk about the upcoming day. We’re the early birds in the house. I always bless his head on his way out in the morning, it’s a small thing but all my kids bend their heads so I can pray for protection over them. I love the way you show love, Laura! Holly, hopefully these ideas are helpful. And pray and ask God to guide you and give you strength and an outpouring of love! Wonderful! Just wonderful! I have 1 son and 4 girls and like you said, I totally get girls but my son?!!? This blessed me beyond my words can express! I will be sharing this one with others! Thank you! Love your site! Thank you, Tawanna … that causes us to depend on God, doesn’t it?! I washed my 19 year olds car for him the other day and you would have thought I gave him a bar of gold. He was deeply appreciative. These tips are wonderful! You are right about the difference between sons and daughters. My daughter would walk in the door from high school and within 20 minutes, I knew everything about her day 🙂 I’d ask my son how his day was and I’d get the one word reply of “Okay” as he headed to his room. However, I thoroughly enjoyed our times in the car on the way to and from sports practice. There were no interruptions while we chatted. I should add that we don’t have cell service in our area and I love it!! I would like to add a tip. When I’m out shopping, I’ll pick up his favorite candy bar or some other small token just to let him know I was thinking of him. He’s in college now and loves to come home to these little treats. Oh, that’s a great idea! I’m going to start doing that, too! Struggling with my 14 year old. He is my 3rd son. He does not want anything to do with me. Makes me so sad. Jen, maybe start buying him treats and offering to pick up a Red Box for him? I’m praying that he’ll come around. Great ideas. How about letting him know how much you appreciate and need his help? His muscles to move something I cannot for example, always brings a smile. Listening to that which I have zip, zero, zilch interest is huge, and I try my best to understand. Des, yes, I nod and smile about books and video games. LOL. I love the idea of using his muscles! My wife shared this article on Facebook and I clicked through and thought I would give my two cents. I don’t know if this will run counter to what this blog usually expresses, but please know that no offense is intended. From a Dad’s (and former boy) perspective, go blow something up/shoot something to smithereens together. Yes; use caution, but allowing a certain amount of playful destruction ebb forth is great source for a teen boy. Better still, let him pick some intended targets. Old toys, action figures, fruit, soda cans with the soda still in them (shaken up just prior for added effect), etc. And Mom’s…. there is the potential that you will be the coolest Mom on the block for not just capitulating to this wanton destruction, but being an active indulgent ordinance expert and enjoy destroying something along with him. This has the potential for creating a lifetime memory/story for him. I love that!!! We just had the conversation of getting some bows and arrows and hay bales for the backyard. Okay, it’s not shooting something, but my son is excited!! This really made me smile!! When I shared I forgot about that. We now live in the country and you’re right. Join in the shooting spree and they’ll be your best friend. I bought a bucket of chalk for our 3yr old grandson and our 11yr old daughter. I never knew they would make great targets. Especially challenging since I use open sites and the boys have to use their scopes. Not really what is like to spend an afternoon doing. But if that’s what I have to do to see all my “boys” smiling and relaxed having fun….oh yes including my husband….then ok I’ll join in too. Outdoor Moms know this makes a real difference. This is so true! We had an old wooden bunk bed frame. It naturally was too large to throw in the trash can. I asked my boys, 14 and 10, to see if they could break it up into pieces small enough to fit in the trash can. Boy did they! They pulled out their old baseball bats, and started swinging! They had so much fun being strong and mighty, while younger brother, 7, and I cheered on their strength and might… After, we laughed and smiled over it for hours…. Great list! Spot on. Number one is hands down the best tip I had to figure out the hard way when my son was 13!!! He was so different and we were not communicating well. He had become so defensive about everything, it seemed like overnight! I heard this tip on KLOVE and started paying attention to when I spoke to my son to utilize this nonthreatening side by side approach. It totally worked! We could discuss everyday things, important things, etc and he was comfortable and even verbose with his thoughts and opinions. This saved me through a rough hormonal time with him. He is now 18 and he has had various friends that he has brought to me to talk about family problems, girlfriend questions, etc. I cherish the moments. The other tips are also excellent! And the additional by your readers, too. I use most, but will implement others, especially now that he will be off to college this Fall. Sincerest thanks! My son loves it when I include his best buddies in our older “childhood” traditions like Valentine’s, Easter, St Patrick’s when I always make sure he has something to mark the day….even if it is just a card, goodie basket, fun pin, etc. Especially since a couple of his friends have never had someone do these little thingsbfor them. I love that holiday idea!!! My readers are the best!! These are awesome tips!! I have 3 teenage sons and sometimes really struggle in my attempts to connect…they are joined at the hip with their dad/my husband, which I LOVE, but I still want to be connected too. Thank you!!! Oh, Melodie, I hope these tips help you! I’m excited to hear! Great tips! I especially love #10 (stop what you’re doing and really listen) and #11 (praising them to others and letting them hear.) Men/boys crave our respect and these two tips alone will go far to show them that we not only love them – but we respect them. You’re welcome, Michelle!! You’re right, respect is so important to men! Tricia, thank you for sharing these great tips. When my son was a teen, my husband told me one of the most important thing for boys is to know they are capable, especially in the current culture where men are mocked and made to look like imbeciles. Whenever my son told me he was going to do something (apply for a job, try out for a sport, etc. ), I made sure that my response was, “You can do it!” My son is now 28, married, has a great job, and is about to become a dad. He recently told me that my encouragement and belief in him gave him great strength and confidence when he had to do something hard. Such a simple thing to do, but so powerful! I love that, Lisa. Thank you so much for sharing!! You’re SO right! My five boys are a challenge. The oldest is 28 and the youngest will be 18 in a few weeks. They all love it when I post certain photos on Facebook and complement them. They also (especially the older three boys) like when I text them randomly. Either with family updates or just to say hi I’m thinking of them and/or praying for them. This usually brings a response or dialogue. I have found if they do contact me, usually by text, I need to respond because it may be a while till I hear from them again. The youngest still lives with us and this works for him as well since he is very quiet. Leaving him notes of what I really need done by him, I always put a favorite snack or candy he likes since he knows I don’t buy them very often. It may seem silly but it really is true, the way to a guy is thru his stomach. Works with my boys. Taking them where they need to go is something new I learned. We have a large family and giving them a ride could make all the difference. I could go on……. I love the way that you’ve shown love!!! wow, thank you! I have three little boys, an almost-six-year-old, a 4 year old, and a 1 yr. old. I sometimes wonder these things too. My little girl is so easy to relate to! I know I need to do a better job with my boys, especially the older two. I love your list, I think a lot of your ideas work for little ones too. I can’t pop in at work, but I can ask them about what they are playing. I especially need to work on numbers 4 and 15. Thank you Tricia, and God Bless! Ask them for answers – and then do as suggested. Guys were made to solve. Not to listen and then do nothing. If you have an issue, and they could solve it, ask them. Its amazing how that can open up the communication lines. The sitting side by side thing works not only in a car, but for a movie, TV show, etc. Guys communicate shoulder to shoulder, not face to face. Teenage Boys: Shaping the Man Inside by Bill Beausay. An outstanding look at how boys think with a very comical twist! This was one of the best I ever read when it came to boys!! I can’t recommend it highly enough! Boyhood Daze: An Incomplete Guide to Raising Boys by Dave Meurer. Some of the ins and outs and whys of raising boys to be men of God. Be encouraged, those with young teens, it does and will get better!! Thank you SO much for these suggestions, Chrissie!! Great stuff! Now if I could just figure out how to do this when he is 250 miles away, living with his dad! I try to send them funny texts or pictures every so often. If I catch all 3 of them in one day, we call it the tri-text-a. I also give them hugs and pats when I can. They pretend they don’t like it, but they really do. Loved this post. I have 4 boys and this rings true. We focus so much on the needs of girls in the media, but our boys need support as well. Thank you for taking time to talk about it! These are great tips for a girl dating a teenager as well. I’m 17 and have been with my boyfriend for 3 years and have learned communication is key to a healthy relationship and sitting back and just listening, even of you really don’t care about that gaming system, does wonders. If you are in a relationship like mine these tips are definitely beneficial to you as well. is there a danger that you may be “over-loving” if you go along with him too much? My wife gives massages and puts him to work (i.e. has him go get her stuff at the store), but if it’s done at a time when he’s got a big test the next morning and he’s exhibiting signs of “not caring” about his grade, that could be counter productive.If he says, the test is too hard, isn’t it time to lift him up and tell him he can do it? Or do we go along with him and say, well maybe this class isn’t for you I understand? I know this is an old thread, but I was so happy to stumble on it (great tips!) and wanted add one thing I do with my 16 year old. I pick him up from school every day. He could ride the bus or catch a ride with several neighbors, but if he rides with someone else, I feel like he does his best sharing with them regarding his day. I love seeing the true reaction to his day-good bad or ugly, before he has a chance to unload on someone else. I started picking up my kids early in elementary after an unfortunate incident on the bus and never stopped because of all I learned on our drive home.